Teen witch Ivy MacTavish wants nothing more than to catch Dean Matthews’ attention at the school dance, so she borrows her vampire friend Gareth’s pet lizard, Spike, and transforms him into a human. Once they arrive together at the school dance, Ivy gets more attention than she bargained for when Spike escapes. As if Ivy needed any more rumors about her–especially since people still talk about her wizard father and his black magic. When a couple of serial killers are brought back from the dead, Ivy is everyone’s first suspect. To clear her name, Ivy and friends join forces to find out who really released the murderers and to recover The Book of Lost Souls so that no one else could use it for its evil purposes. As much as she hates to admit it, she needs demon Nick Marcelli’s help to find it. The last person that Ivy wants to fall for is Nick, but the more she’s around him, the more she finds him irresistible. In the tradition of Kelley Armstrong and Kim Harrison, indie author Michelle Muto has penned a YA paranormal ebook that is quickly gaining notice on Goodreads and Twitter with paranormal readers. I knew I wanted to read this one when I saw Michelle’s tweets, and immediately contacted her to see if she would like me to review it for her. The Book of Lost Souls starts out with Ivy casting a spell to create a hot date for their school dance. I loved getting to see spells in action like in Harry Potter, but wish I’d gotten more clear images in my head about what the spell caster is doing while casting the spell, and also if there is any kind of tiredness factor that comes into play after a spell is cast. Perhaps the aspect of this novel I enjoyed the most was how unpredictable it is. There are so many twists and turns that will keep readers interested and guessing throughout the entire novel. And then there’s Nick, who is a demon, but not at all what you might expect from one. I really loved getting immersed in this make-believe world. Though I did like the book, I do find it necessary to mention that the finished text is pretty rough. If you are like me and tend to catch every single error in the books you read, you will find yourself getting pulled back into the real world while reading this when you just want to stay lost and involved with Ivy and her friends. Punctuation and grammar were my biggest concerns in The Book of Lost Souls, but if you can look past them, then you are in for a treat! Follow Michelle Muto on Twitter @MichelleMuto and connect with her on Goodreads. 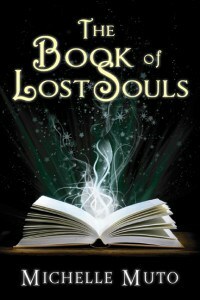 Through July, you can purchase The Book of Lost Souls for 99 cents on Amazon.com. The ebook can also be purchased through Smashwords.com and downloaded for nook and other ereading devices. Pingback: “G” The Book of Lost Souls « A.B. I’m always scanning review blogs and Amazon lists looking for good and appealing YA stories for the many teens in my life. I came across Book of Lost Souls on one of my Amazon lists. I read it and I agree with much of the above review, but was puzzled by the reference to grammatical errors. As a professional editor, I’m frequently appalled by the errors I find in so many books, even those coming from the major presses, and I agree they can jump you right out of a story. But I actually found Book of Lost Souls to be well done and surprisingly free of such errors. In any creative effort, there will be some license taken with perfect grammar and that’s expected. But this book was also remarkably clean in terms of punctuation and so on. I found Book of Lost Souls to be a well-written, fun and lighthearted story with some worthwhile themes for teens. I’ve recommended it to all of the teens/parents I know. Thanks so much for entering, everyone! I honestly appreciate all the tweets and follows. Jennifer has the coupon codes to hand out to the winners.